This document has been developed and endorsed by the Canadian College of Medical Geneticists (CCMG) and the Canadian Association of Genetic Counsellors (CAGC) with the financial support of Health Canada. The CCMG and the CAGC are the Canadian certifying bodies for Medical Geneticists and Genetic Counsellors, respectively. Together with provincial and federal government authorities and other professional bodies, the CCMG and CAGC play an important role in establishing standards for the provision of genetic services in both research and clinical contexts in Canada. 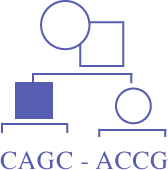 The CCMG and CAGC both strive to foster a culture of ethical behavior in the field of medical genetics. The essence of the process of informed consent is to maintain the rights and welfare of research participants and to protect research participants’ personal autonomy. Both the CCMG and the CAGC believe that a non-coercive approach to recruitment of research participants is necessary for an ethically responsible process of informed consent. Please download the full document for details on how to approach genetic research, and in particular, the informed consent process for genetic research.